We explore object discovery and detector adaptation based on unlabeled video sequences captured from a mobile platform. We propose a fully automatic approach for object mining from video which builds upon a generic object tracking approach. 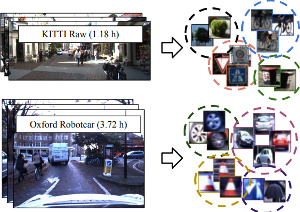 By applying this method to three large video datasets from autonomous driving and mobile robotics scenarios, we demonstrate its robustness and generality. Based on the object mining results, we propose a novel approach for unsupervised object discovery by appearance-based clustering. We show that this approach successfully discovers interesting objects relevant to driving scenarios. In addition, we perform self-supervised detector adaptation in order to improve detection performance on the KITTI dataset for existing categories. Our approach has direct relevance for enabling large-scale object learning for autonomous driving.